A more stylish, less practical 3-series. 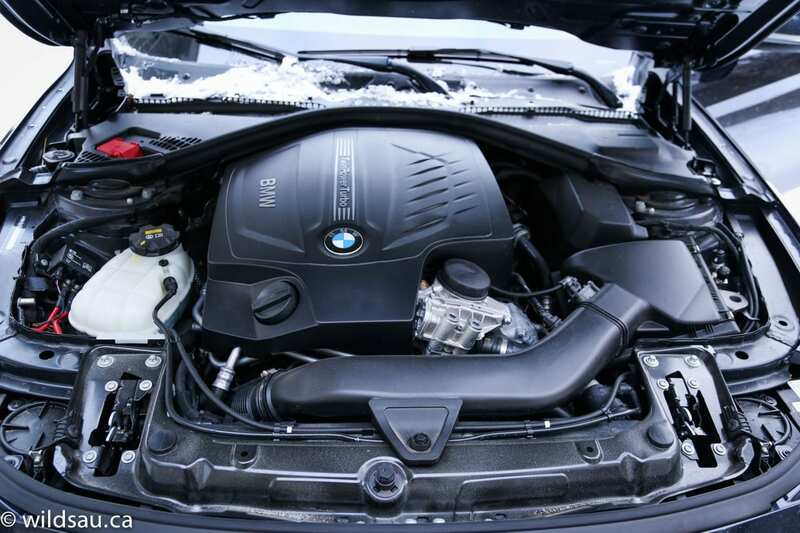 While some will see this as a restricted, less useful version of the best-selling 3-series, BMW wants you to think of it as a fresh dimension on their 4-series coupe – one that adds the functionality of four doors. 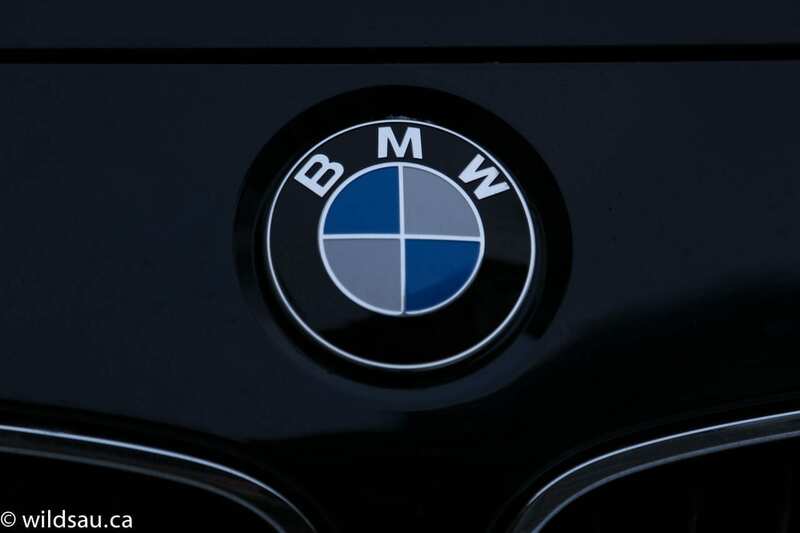 Did we need yet another branch on the BMW family tree that has grown to epic proportions already? Heck no. 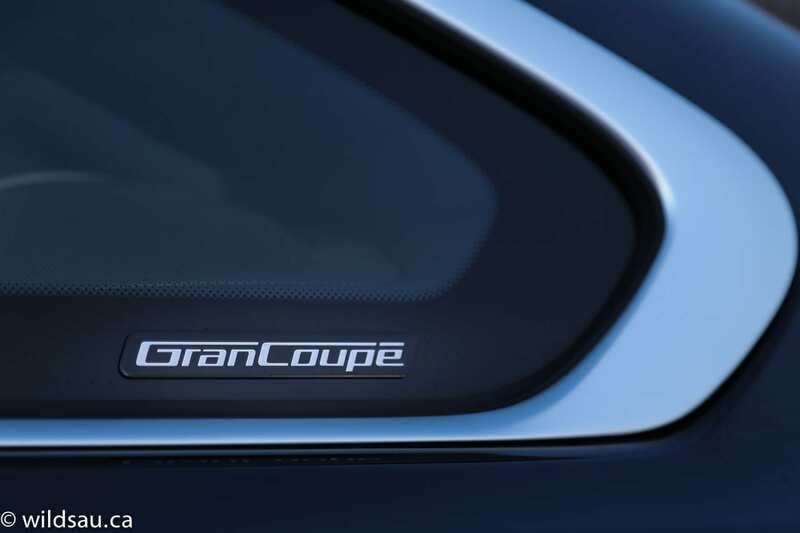 But it’s an interesting branch, this Gran Coupe thing. 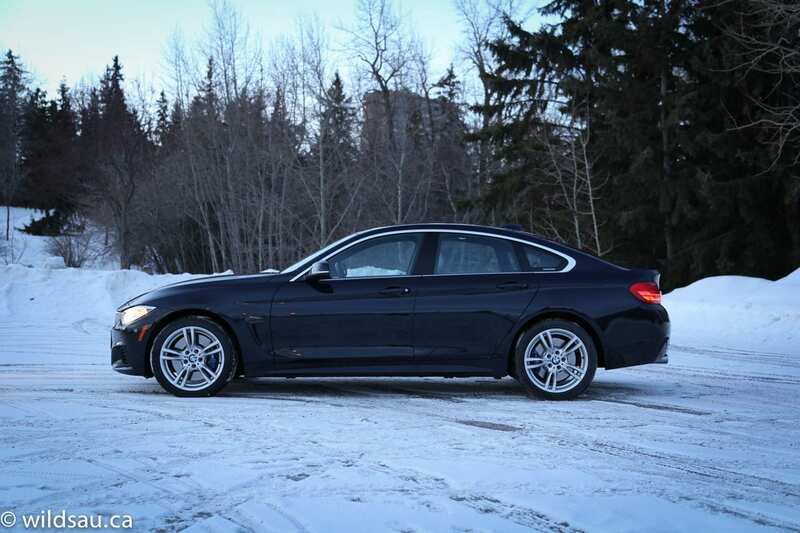 It has the same dimensions (length, width, wheelbase and track) as the 4-series coupe. But the longer roofline and (slightly) higher silhouette allows for more space inside. 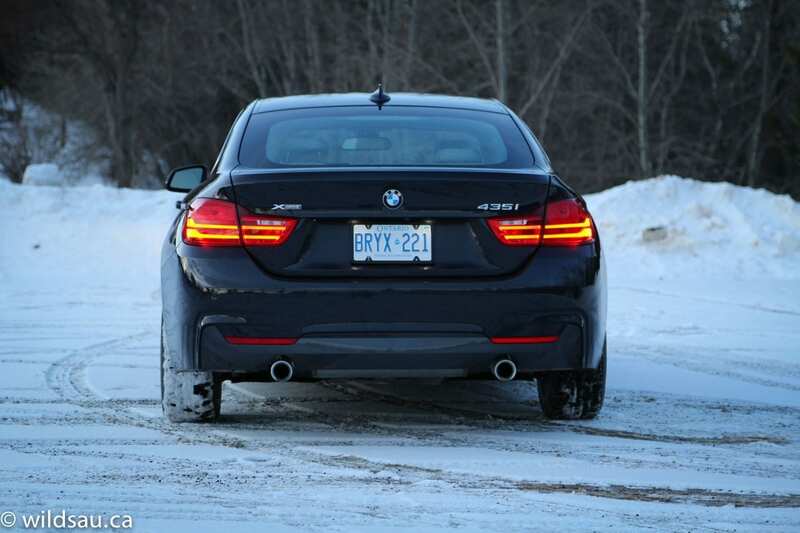 In my opinion, it is a very nice looking car, and it had plenty of 3-series owners’ attention. Not just because it’s a looker, but because they couldn’t quite figure out what it was. 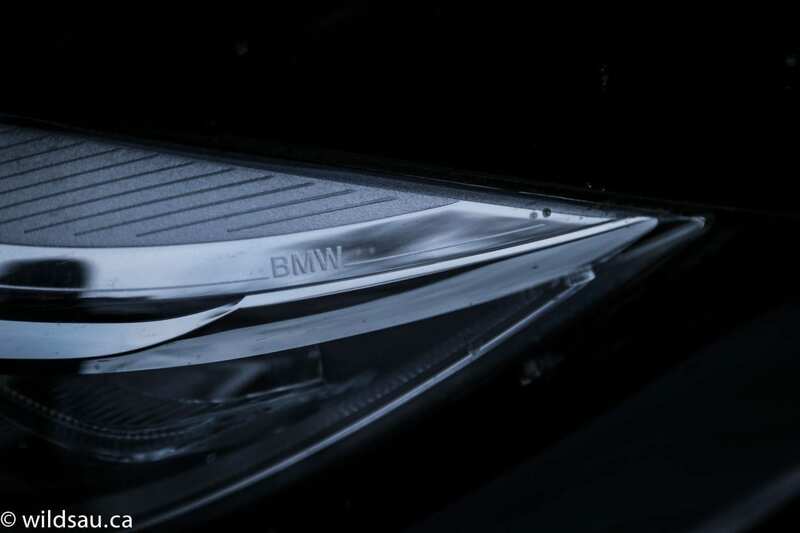 True, there are enough cues (LED corona rings up front, corporate LED tail lights) that it’s instantly recognizable as a close relative of all current BMW sedans, but it’s sleek enough to set itself apart. It’s taut, it’s smooth, it sports hood bulges and flared wheel wells. You’d be forgiven for seeing a coupe first, before noticing four frameless doors. 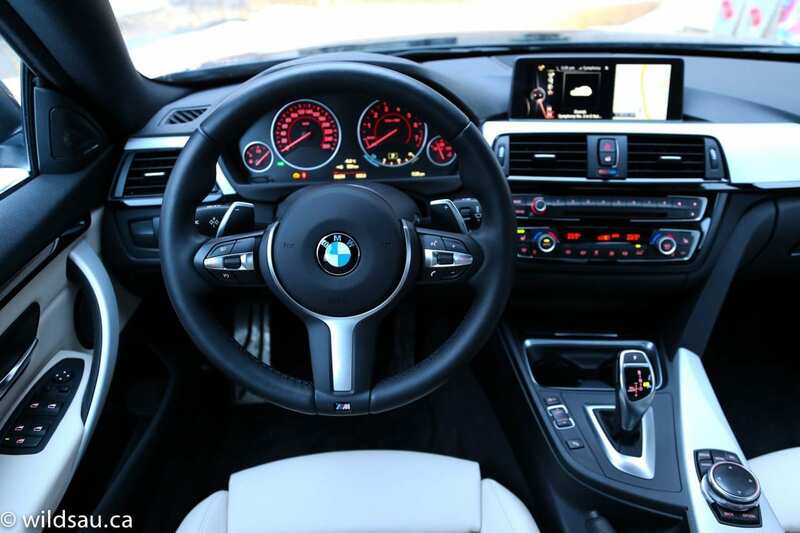 Obviously the 435i’s styling has an impact on its interior dimensions. You’ll even notice the lower roof as you try to get in, and head room up front is reduced but acceptable. It’s spacious enough. The cabin is typical current BMW fare. Nice, soft-touch materials, two-tone colour scheme, good fit and finish. There’s a weird carbon-fiber-themed plastic trim that stands out in an otherwise classy cockpit. As I expected, the heated seats are a nearly perfect combination between comfort (we took the 435 on an 800 km road trip) and sport, offering up plenty of bolstering for aggressive driving. 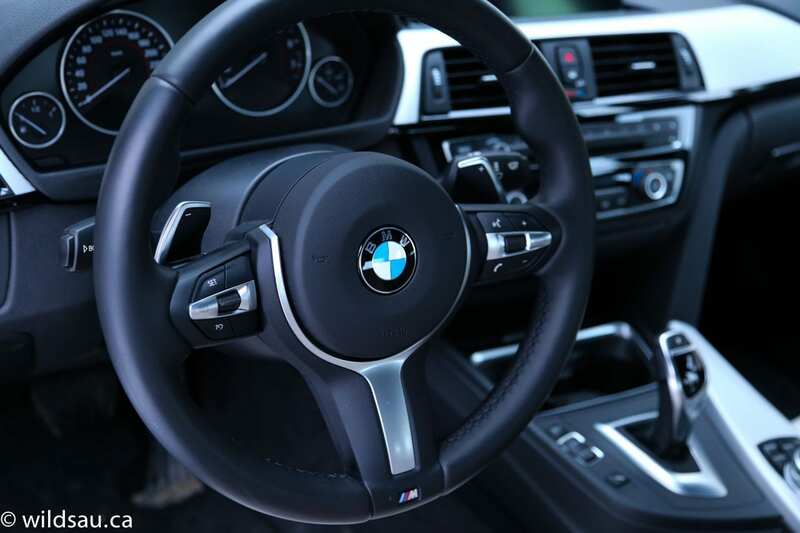 The heated M Sport steering wheel feels great in hand, and has controls for media, cruise and your phone. 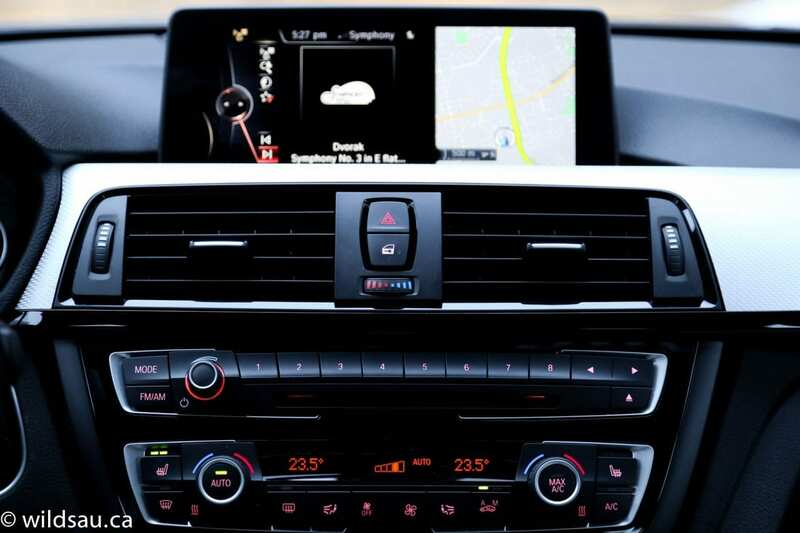 Behind it are BMW’s typical no-nonsense, gauges with tightly-spaced numerals and a well thought out driver information screen. What’s not well thought out is the iDrive system that runs the beautiful wide screen sticking up out of the dash. 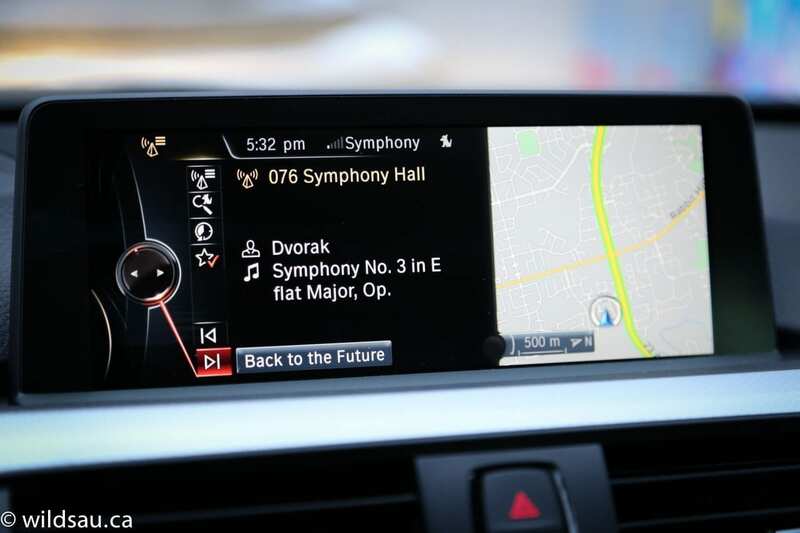 The way BMW has organized things is simply awful and the general user interface (including the merciless use of incomprehensible icons) remains unfriendly and inflexible. I should have to pull out the user manual in order to program a couple of radio station presets. It might be one of my most-disliked ICE systems. That said, the rotary joystick knob (with handwriting recognition pad on top) and the hard buttons around it work well, and navigating parts of the system slowly starts making sense. 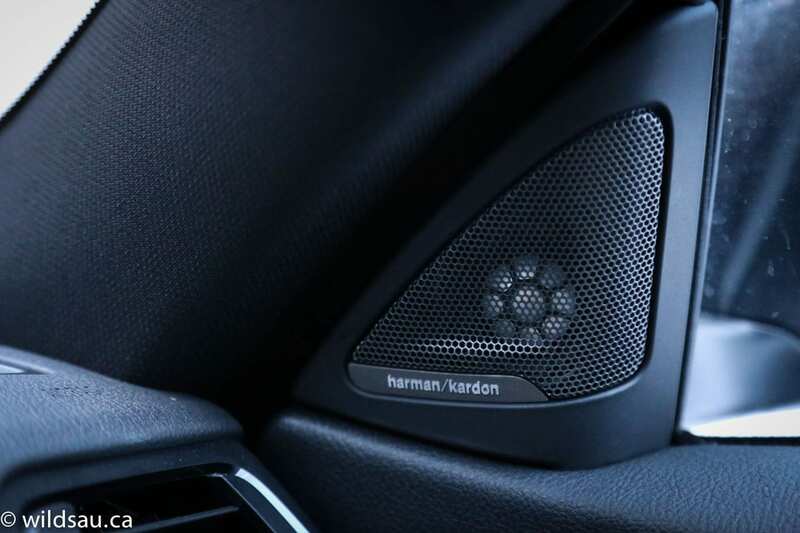 The Harman/Kardon sound system, once you figure out how to work it, sounds great! Driver assistance tech comes in the form of a fantastic full-colour heads-up display (which includes speed limit information), a rear view camera and parking distance sensors. Once you get in the back, you really start paying the price for the swoopy-coupey styling. There’s minimal head room (I, at 5’10” had barely enough) and limited leg room. There’s also a massive central tunnel in the floor effectively making this a 4-passenger vehicle – even my little 4-year-old son hated sitting in the middle. There are LATCH anchors for two child seats if you need them. With all that said, if they’re not too tall, two adults would be reasonably comfortable, cocooned in their heated rear seats. 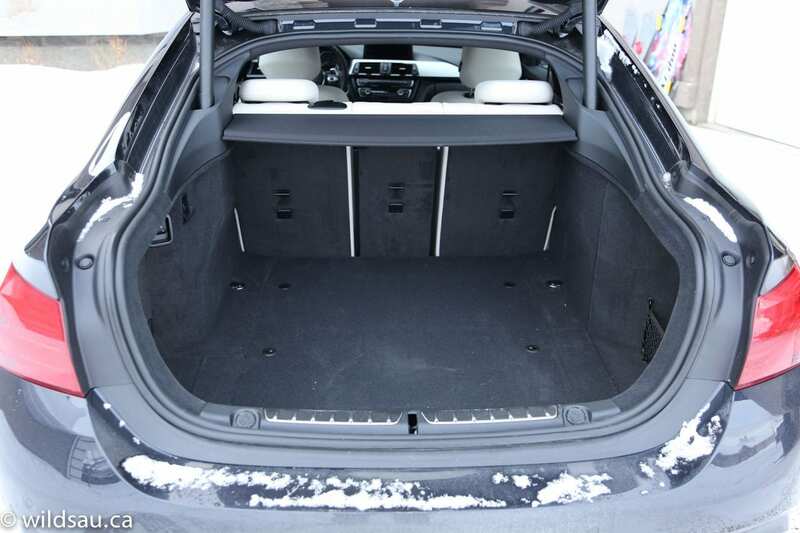 There’s minimal space for storing your stuff – you’ll find a couple of small spots in the console – but the real party trick here (and one of this car’s redeeming features) is the trunk. 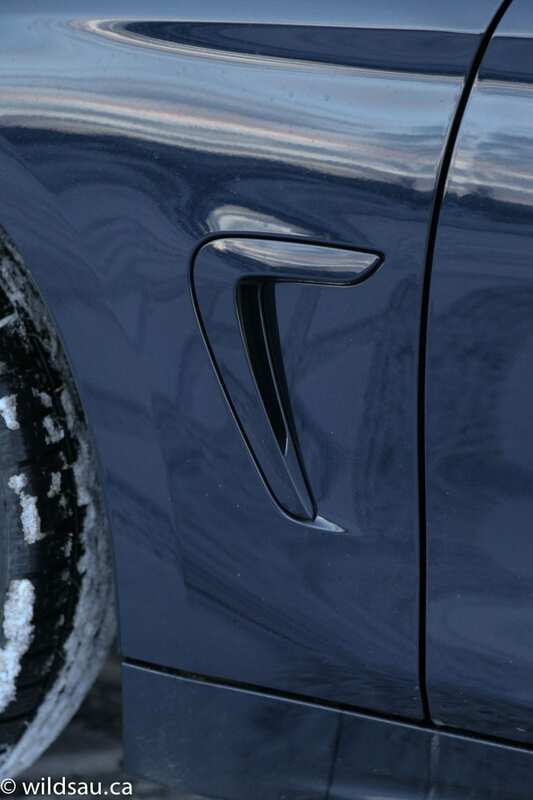 Contrary to what the Gran Coupe’s shape might have you thinking, there isn’t a conventional trunk. It’s a deep 480L tailgate, and the entire rear window and deck lid are part of a powered hatch that gets out of your way. Very accessible cargo space, and plenty of it. We took our family of five to the mountains for a three day weekend and had some room to spare. There’s a small angled panel between the open panels that, when closed, effectively secures and hides all the trunk’s contents. It’s very well designed and very useful space. 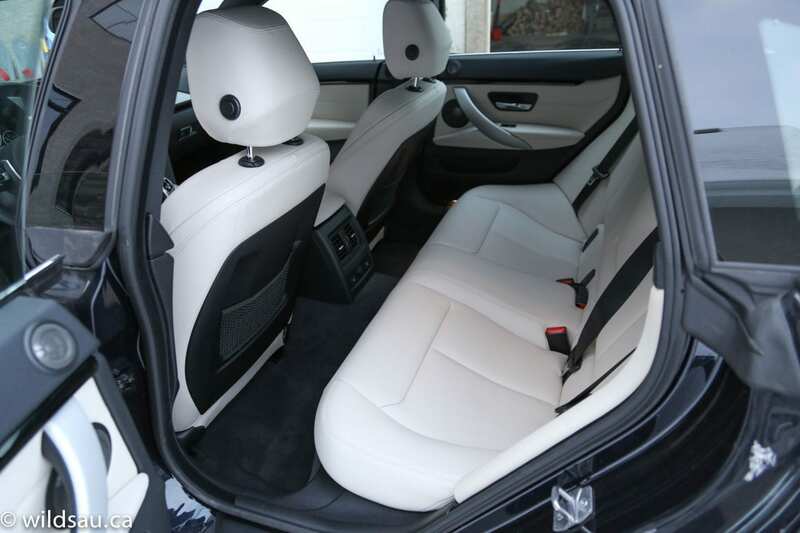 If you need to, the rear seats fold down in a 40/20/40 split and you end up with 1300L when they’re all folded down. That’s a lot. 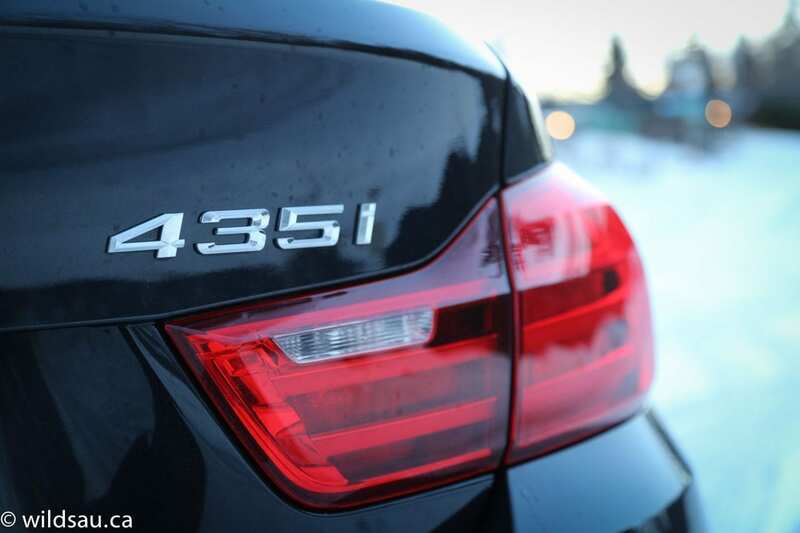 The “35” in this car’s name lets you know that it is powered by the mighty 3L turbocharged inline-6 (perhaps one of the last ones from BMW) putting out (what is a very likely underrated) 300 horsepower at 5800 RPM and 300 lb.ft of torque at 1200 RPM. 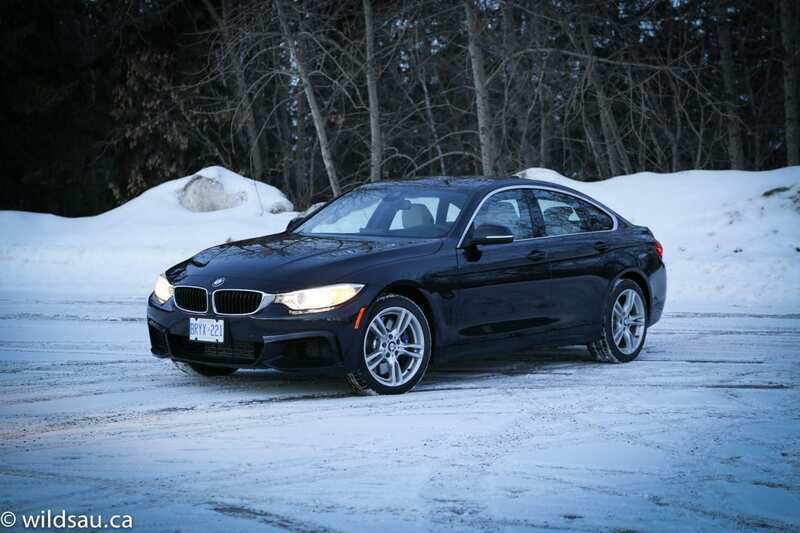 The Gran Coupe feeds this power through an 8-speed automatic which distributes the goods to all four corners via the xDrive all-wheel drive system. Fuel economy is rate at 11.8 L/100 km (20 US mpg) in the city and 7.8 L/100 km (30 US mpg) on the highway. After a week of city driving and an 800 km road trip, we averaged 9 L/100 km (26 US mpg). Sounds about right. 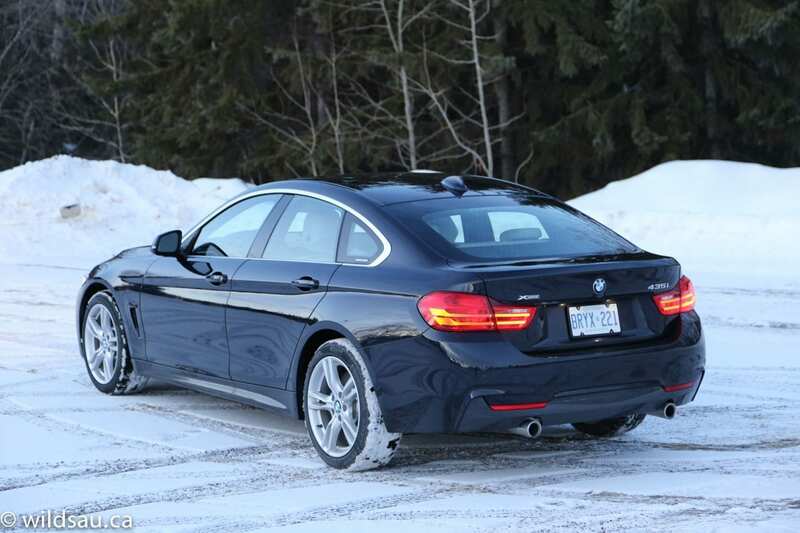 The 435 is a well-insulated and quiet car – even at highway speeds. 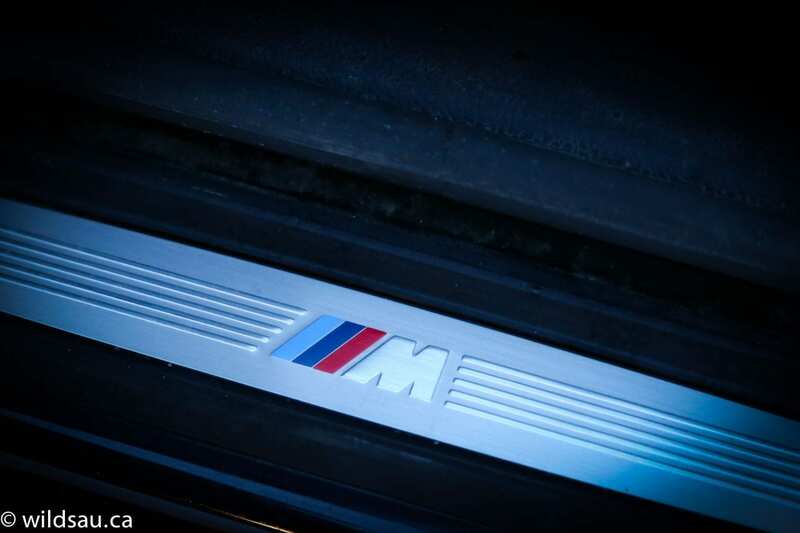 But when you step on it, you’ll hear that beautiful, mechanical rasp of BMW’s smooth straight-6. And when you step on it, you’ll realize this car is fast. 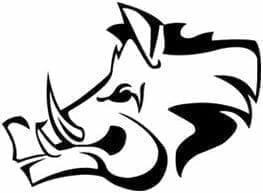 0-100 km/h happens in 5.2 seconds with no lag and no drama. There’s ample power, even for this shockingly chunky 1869 kg (4120 lb) Gran Coupe. When you’re on the go and have the need to dip into the power, the car doesn’t hesitate to serve it up, especially when you’re in Sport mode. Passing on the highway is sick fun and I couldn’t help but giggle a few times when I easily lost someone who was tailing us – they became but a distant memory (and speck in the rearview) in mere seconds. 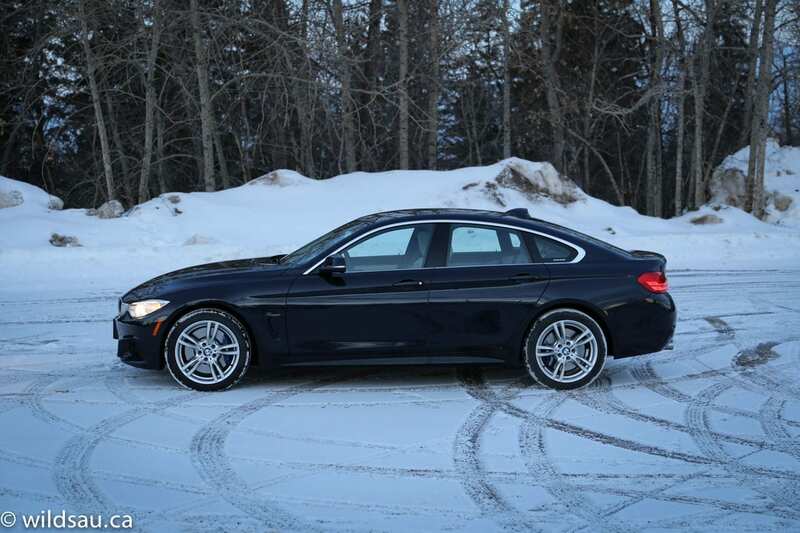 Thankfully my review car was kitted out with the very well-priced M Performance Package, which adds handsome 19-inch M rims shod with staggered rubber sizes – 225/40s in the front and big-boy 255/35s in the rear. 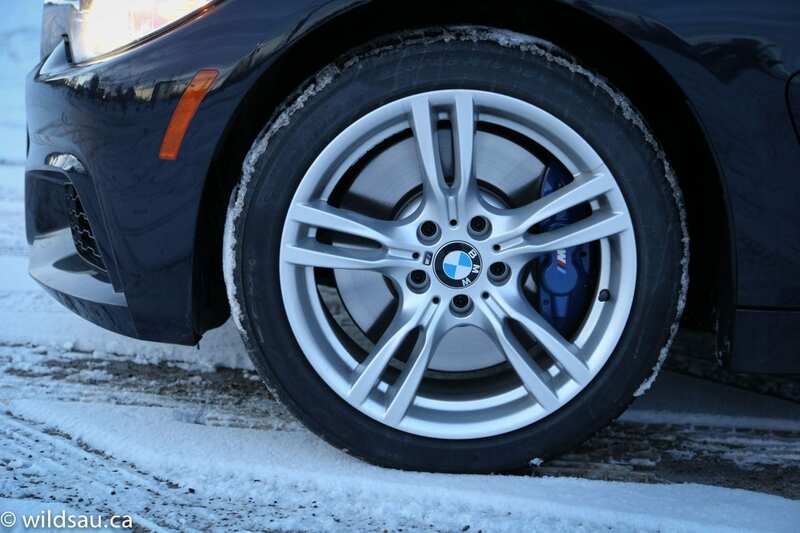 The M package augments the visual boost from the wheels with great stuff under the skin too. 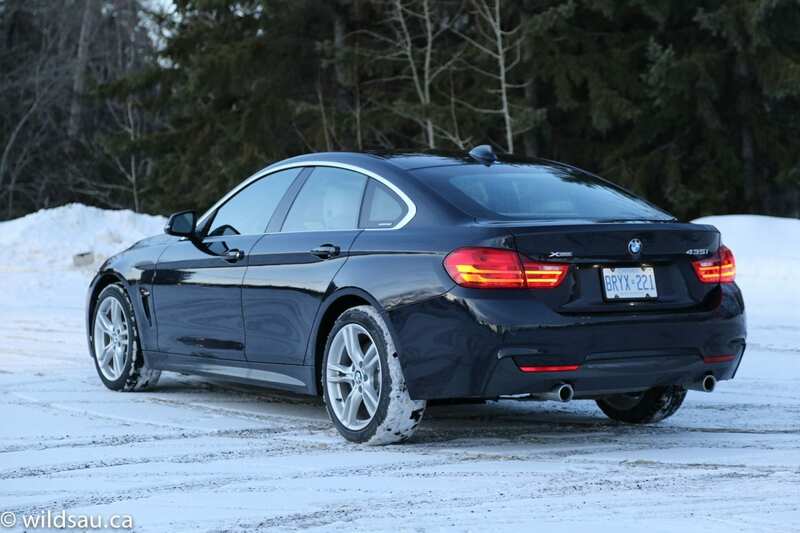 Upgraded M Sport brakes, adaptive M suspension and variable sport steering. 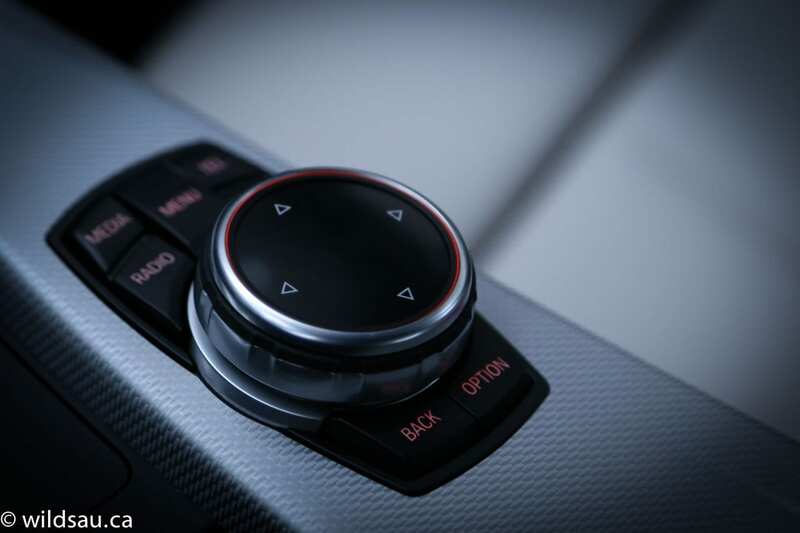 The Driving Experience Control allows you to choose between four modes: Eco Pro, Normal, Sport and Sport+. Thankfully, you can actually tell that something happened when you toggle through the modes. Sport mode is fantastic, significantly firming up the suspension, sharpening up the throttle response, shifting more aggressively and holding shift points much longer. It makes for some dynamic driving to be sure. The 8-speed transmission isn’t lazy but might shift slower than you’d expect in Normal driving mode. It’s very smooth, and its programming is highly intelligent, allowing it to be in the right cog almost all the time. 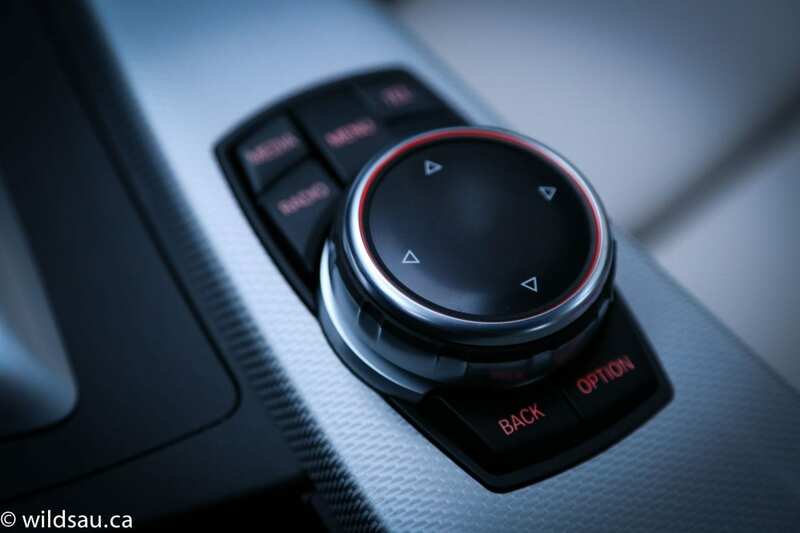 Gears can be shifted manually with paddles or the gear selector. 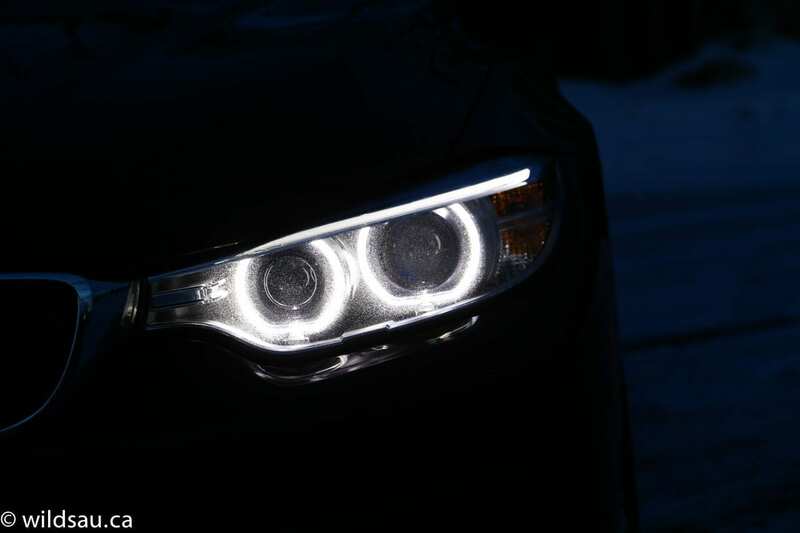 While the car’s ride was always on the firm end of the spectrum, it never became harsh and if you like the feeling of driving something sporty, you’ll likely find this to an ideal balance. I loved it. Handling is agile even for such a weighty car. Turn-in is immediate, the variable steering ratios are nearly perfect and there’s feedback through the wheel. The car stays flat and its ability to negotiate tight corners and sweeping curves is sublime. 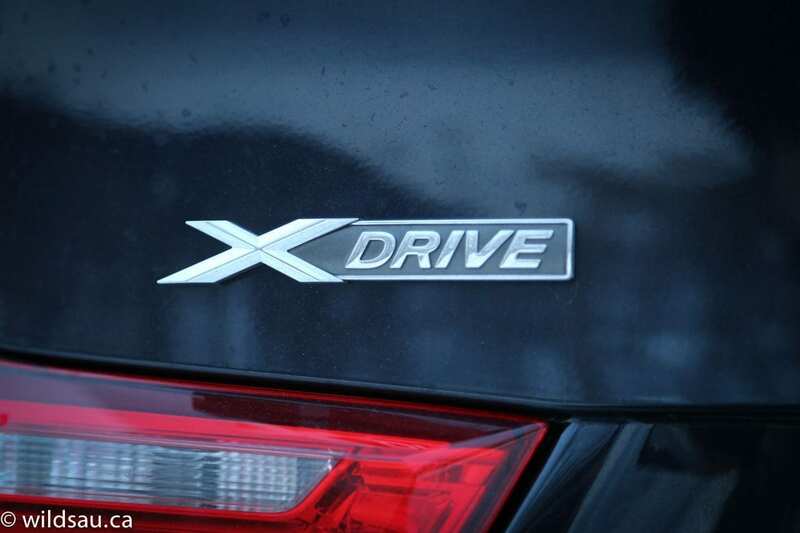 xDrive has evolved into a very capable system over the years and it’s outstanding in this application. Transparent until you need traction, either on dry or slick surfaces. 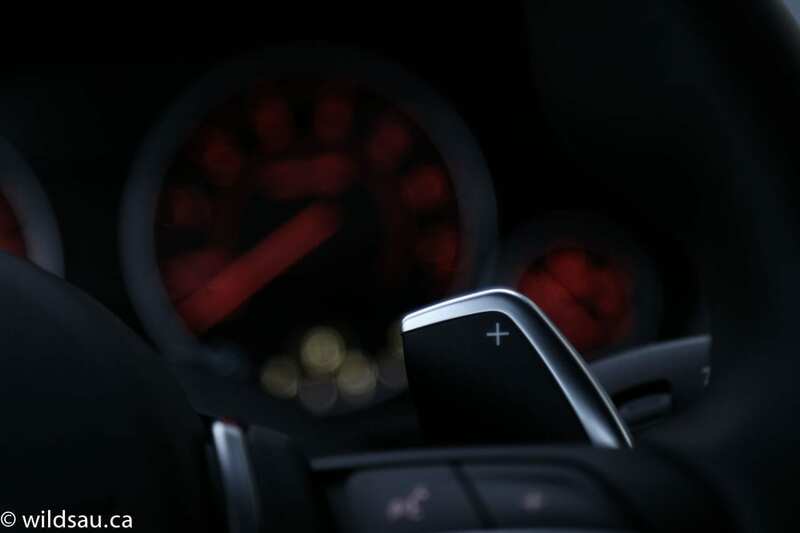 The brake feel is nicely balanced and sits somewhere between easy to modulate and drive in bumper-to-bumper traffic and powerfully grabby and ready for the track. While visibility out of the front and sides is great, shoulder-checking isn’t for the faint of heart, and the rear view is negligible. 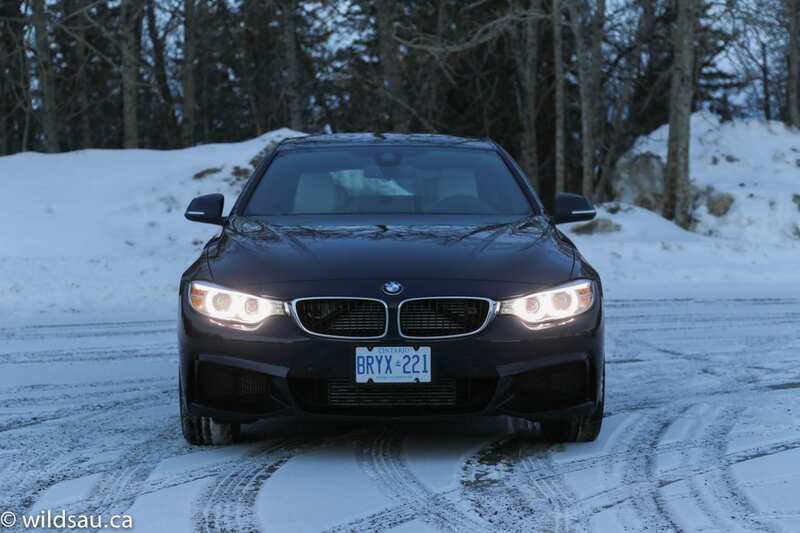 In the end, there’s no denying that the 4-series Gran Coupe is a great car. It looks fantastic, it performs very well in nearly every aspect when it comes to the driving experience and has a wonderful, flexible trunk. WAF (Wife Acceptance Factor) was exceptionally high. She once joked it’s called the 3-series because you see one every 3 minutes and as nice as it is, she felt it’s no longer special. But she loved that this car looks different and sportier while offering plenty of trunk space. The interior worked well for her, other than our shared hatred for the iDrive system. 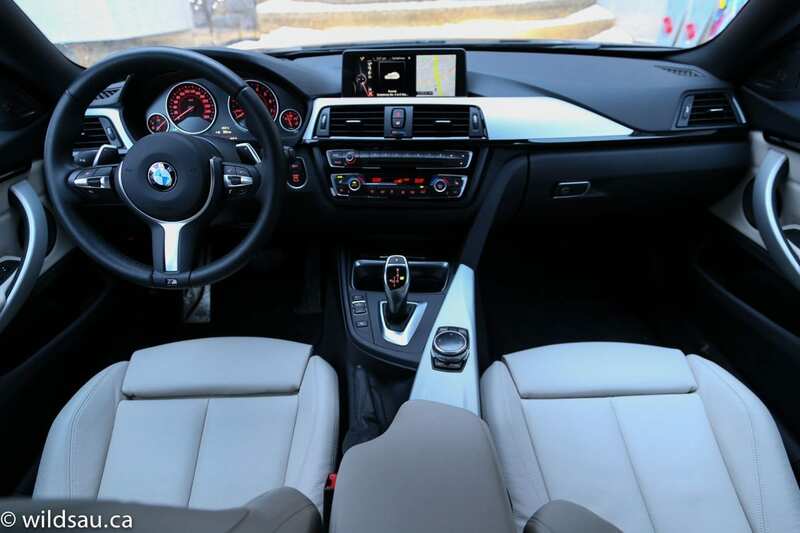 The question is, if you’re in this part of the market, whether or not your need for interior space (in the back seats mostly) surpasses your want for Gran Coupe styling. 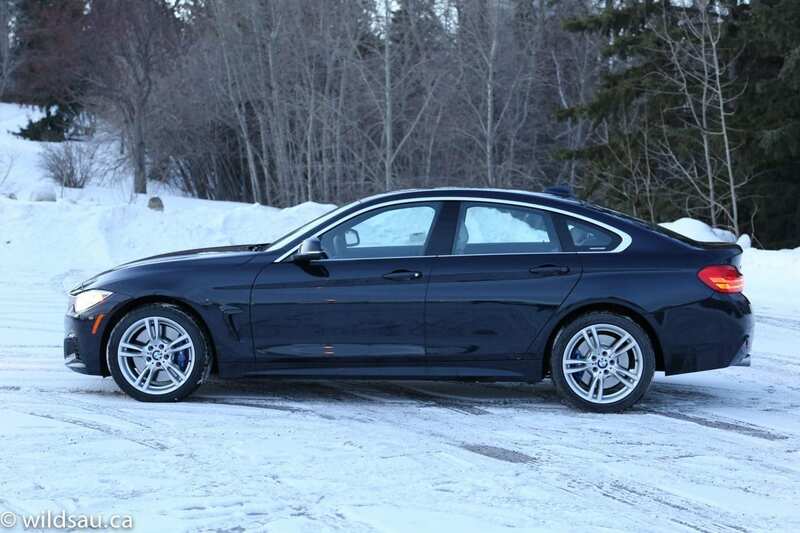 Because what you’ve got here is a more stylish 3-series that’s just slightly less practical. 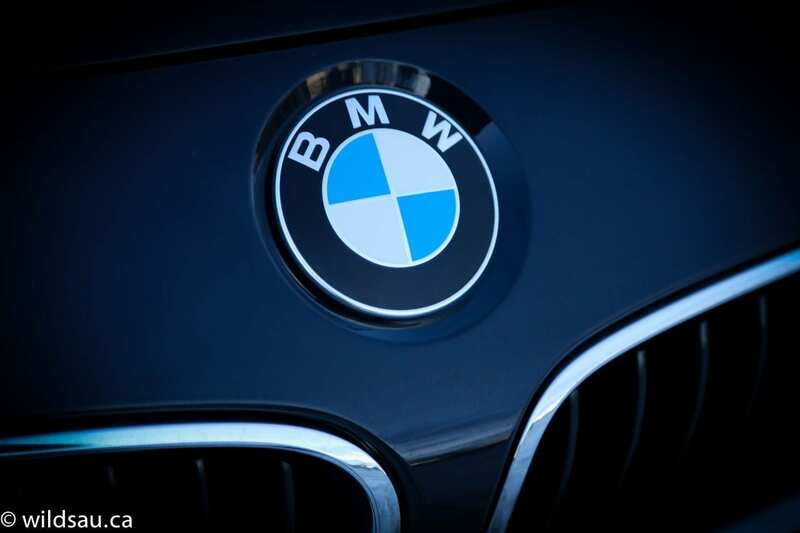 You’ll pay a bit more – an equivalent 3-series starts at about $3000 less. Your call. I’d take this car over the 3-series any day.